It’s Tosanoides Tuesday for the second week in a row! 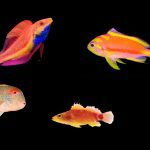 Just last week that we were greeted to the resplendent beauty of Tosanoides aphrodite—a species that’s so obnoxiously eye-catching that it’s gone viral outside of the fish nerd media—and today we have another vibrant entry into the genus, T. annepatrice. This is a fish that has been known for quite some time, having first been collected from Palau more than a decade ago during filming of the BBC’s Expedition Pacific Abyss documentary, and it’s presently on display at the Steinhart Aquarium’s epic Twilight Zone exhibit. That original specimen, collected by legendary mesophotic explorers Dr. Richard Pyle and Brian Greene, sat patiently pickled in a jar all these years until additional specimens could be acquired for genetic study, which finally happened at Pohnpei, Micronesia in 2016. 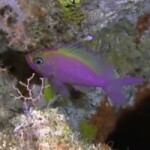 Described in the latest edition of ZooKeys, T. annepatrice is instantly distinguishable from others in this small genus by the unique coloration of males, along with the shape of the fins. 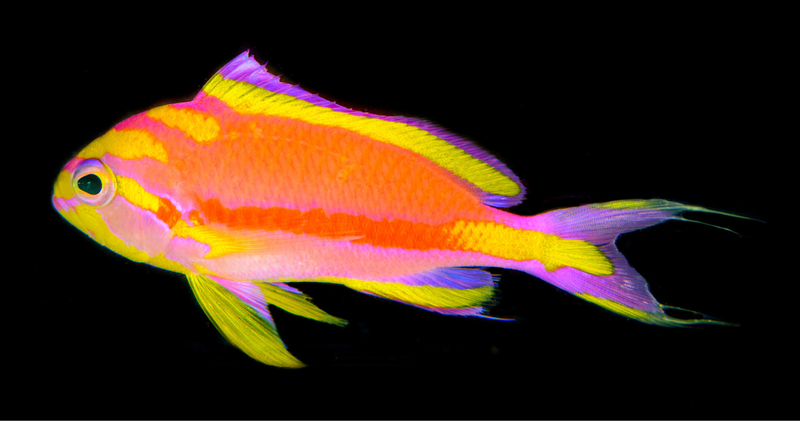 The coloration is a bit reminiscent of both T. flavofasciatus and T. filamentosus, having the forebody covered in alternating yellow and pink stripes, but the shape of the fins, along with the available genetic data, point towards the latter being more closely related. Females, on the other hand, are mostly yellow. To find this fish in the wild, you’ll have to travel to Micronesia and dive down into the rariphotic, roughly 115-150 meters deep. 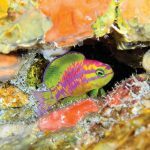 Here, small harems of this fish scurry about steep limestone escarpments, alongside some of the other colorful highlights from this realm, like the pair of groppos found there by Brian Greene. This species pays homage to Brian’s momma, Anne Patrice, who clearly raised her boy right. Tosanoides is really a fascinating little genus, with much left to uncover. Its members in the Indian Ocean, if there are any, remain undiscovered, and the extent of the Pacific fauna is known only from bits and pieces, with another possible member waiting to be described from Easter Island. 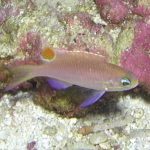 Last week’s description of T. aphrodite paints a portrait of this genus as being circumtropical, or at least partly so, but anthias are in general a poorly understood group, with a classification that probably doesn’t reflect their complicated evolutionary history all that well. 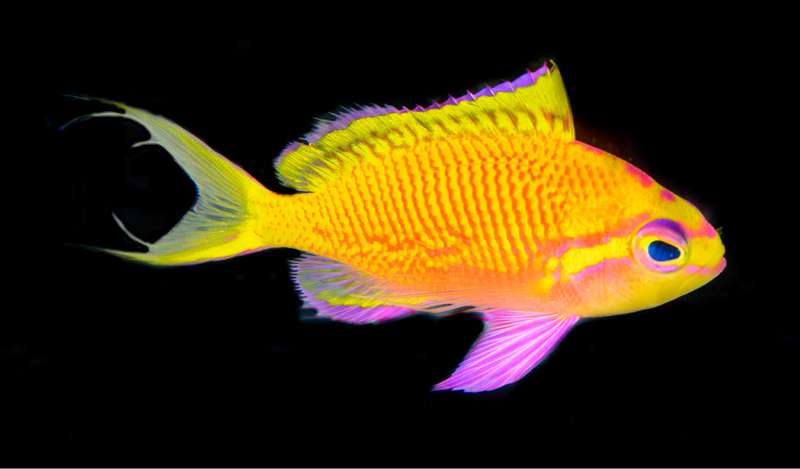 A case in point is briefly alluded to in this new paper, which devotes one tantalizing sentence to the idea that Hawaii’s Pseudanthias fucinus, one of the most enigmatic and elusive of reef fishes, may actually belong among this small lineage of deepwater species. 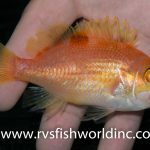 This notion is bolstered by the existence of the Aphrodite Anthias, which has both a similar shape to its fins and a comparable color pattern. But whether these two misfits really belong here is an open question that awaits more detailed study. The deep sea is, as always, slow to reveal her secrets.